I don’t think this beautiful lady needs an introduction but if you don't know who she is, I will give you a little low down. Madeleine Shaw is a nutritional health coach with two best selling cook books that provide you with over 200 recipes that allows you to have a whole new relationship with food, makes you feel good from the inside out and of course GLOW. With over 260K followers on Instagram, Madeleine is one of the top go to women for eating well and being well. I have always had curves and secretly envied the girls who were ‘small boned,’ not in a horrible way, I would always just look at my body and think, it would be nice to be a little smaller. So after my first daughter was born and we had established breast feeding, I couldn't quite believe how much it had stripped me of any curves I once had. I look liked a very pale boy with slightly loose skin and swollen breasts. On reflection, my face looked a little gaunt too. At the time, I was like, this is great, I can get into size 8 jeans (I was a 10/12 before pregnancy). But people were telling me I looked ill and too skinny, I didn't understand because I was practically having cake for breakfast. No one told me that breastfeeding makes you into the Cookie Monster or cake monster in my case. I already had a sweet tooth, throw in lack of sleep, lack of time and breast feeding into the mix, I was like Miss Piggy on crack. I ate when I could, binged on toast and every cafe I visited I made sure that an almond croissant, cake, or brownie came with my coffee. Did I put on any weight? No because Lily was literally sucking the calories out of me. But I would be very bloated at times and would suffer terrible with tummy ache. 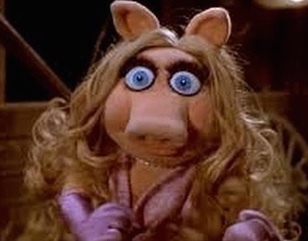 Miss Piggy on crack - ME! However, I crashed and burnt when Lily was about 6 months old. I still don't know to this day whether or not I had PND. But I was low, I had a lack of energy, my moods were all over the place and my positivity would waver a lot and those who know me, wouldn't use those words to describe me. I also let Lily’s non-existent sleep get to me all the time. I knew things needed to change, I started going to the gym after the Christmas but it was all a bit lack lustre. THEN Madeleine Shaw enters into my life, not literally but Millie Mackintosh posted a picture of Madeleine’s first book Get the Glow on Instagram (they’re mates, I love it when girlfriends share the love) and I ordered it on Amazon that day. When I read I had to cut out refined sugar, I was like, say what now? You're taking the piss right? Shut up darlings - my head hurts! After the 6 week challenge ended, I kept up with Madeleine’s way of thinking from Monday to Friday and at the weekend I completely relaxed. She’s not unrealistic, she knows its good to treat yourself. The reason why she appealed to me so much, is because though I don't know her personally, she came across as down to earth in her books but also on her website, Instagram and YouTube channel. She isn't preachy, she isn't in your face, she is normal and loves what she does. I promise, its not like, eat one boiled egg for breakfast, now have a green juice 6 hours later and then for dinner have raw broccoli. I would have burnt the book if it was like that and go straight to the cupboard for my sugar fix. This post is not saying don't have cake, don't you ever eat refined sugar again! I wouldn't tell anyone what to do because you would quite rightly tell me to bore off! Also when I got pregnant the second time around, I ate whatever I wanted but after having Robin I have been careful not to overload myself on the really bad stuff this time around and i’m now taking up the Monday- Friday philosophy (most of the time). But if you do feel like changing your eating habits a little or have the same issues I had above and want to focus on a new relationship with food, then maybe give her 6 week challenge a go. So I was over the moon and very grateful when she said yes to a little interview over email and answered a few of my questions about the importance for new mamas to eat right and how to get that GLOW back into our skin. 1. Why do you think too much refined sugar is not good for a mother who is pregnant or breastfeeding (especially if their hormones are going through an important transition)? The issue with refined sugar is that it gives you immediate energy but then you crash. When you are pregnant or breastfeeding your body needs twice the amount of vitamins and nutrients compared to someone else, refined sugar contains pretty much zero nutrition so isn’t providing mummy or baby with anything worthwhile. There are so many ways to introduce sweetness into your diet like fruits and honey which will curb that craving for refined sugar and keep your energy levels more balanced. 2. Is there a product out there that you would recommend that helps to bring a glow back to tired skin? I find that my skin looks its dullest when my digestion is not on track, as a new mummy it could be difficult to make sure that your body is getting what it needs from the inside too. Make sure to keep eating lots of seeds (full of vitamin E), ginger (full of anti-inflammatory properties) and water (to keep your beautiful body hydrated!) Also invest in a good quality face mask and eye gel (I love Origins products), pop these on while cleaning up or even while baby is eating for an extra boost of love to your skin. 3. Why is a calorie counting diet not a good way to create a new relationship with food? Calorie counting doesn’t work because food like nuts, avocado, eggs and oils contain high levels of fat so therefore higher calories, but these are good fats which contain loads of nutrients which your body actually needs. Calorie counting can get obsessive as you are focused on the number of calories and not the nutrition your body needs. 4. Many women who become new mothers struggle to remember to eat themselves and then binge on the likes of bread, crisps or cake. What quick healthy snacks are good for women who find themselves in this situation? Snacking smart is essential to feeling good and switching to high protein snacks helps fuel you for longer, try and pick up things like a handful of nuts, 1/2 an avocado, some smoked salmon on rye bread, a green juice or smoothie, some berries, a pot of yogurt or chopped up apple and almond butter. 5. Mothers go through a number of hormonal changes, which isn't helped by lack of sleep, this can sometimes bring on low and teary days, what food can help boost mood and energy? Spirulina Nibs are perfect to sprinkle on porridge or into a smoothie for extra energy boosting goodness! Naturya Superfood Seed Crunch, this is a great supplement to add to your breakfast to ensure you stay full and awake all morning. There’s 5 superfoods in it so plenty of nourishing micronutrients to help you get your glow back and matcha tea is the superfood drink of the moment. It’s full of antioxidants and it naturally contains caffeine which will boost you when you’re feeling tired. You can try making a matcha latte with rice milk if mixing just with water is too strong. 6. You practice mindfulness, yoga and pilates, why would you recommend these practices to women who are going through such an important time in their lives? Meditation is all about relaxation and recuperation. It is really important to take some time for yourself, be mindful, exercise, breathe, do yoga, eat well, hydrate and reduce toxins and smile. By practicing personal, quiet activities like meditation, yoga or Pilates you are taking a moment for yourself, and showing ourselves love is a wonderful way to reduce stress mindfully and bring the inner glow to the surface. 7. What top 3 cupboard staples do you recommend always having? My go to cupboard staples are coconut oil, eggs and porridge oats. I always have these around because there is so much you can do with all of them. 8. Finally, what is your favourite food guilty pleasure? I absolutely love crepes! I could eat them with anything; sweet or savoury! I have even made a beetroot variation in my book, Ready, Steady, Glow! Pancakes on a Saturday morning? Yes please. If you love chilli, try this, quick and easy.